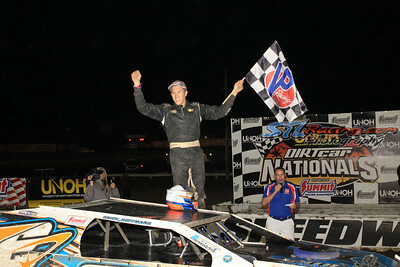 CLICK HERE FOR MORE PHOTOS FROM VOLUSIA SPEEDWAY PARK! For more information, go to www.DIRTcarNationals.com . Follow the event on Twitter @DIRTcarNats and on Facebook at facebook.com/DIRTcarNationals. A-Main (20 Laps) – 1. Nick Hoffman ($1,000) ; 2. Kyle Bronson; 3. Dale Mathison; 4. Justin Allgaier; 5. Kelly Shryock; 6. Kenny Wallace; 7. Ty Dillon; 8. Kody Weisner; 9. Dave Wietholder; 10. Ken Schrader; 11. Brendan Gaughan; 12. Denny Schwartz; 13. Bryce Jewell; 14. David Reutimann; 15. Bart Hartman; 16. Tyler Nicely; 17. Austin Dillon; 18. Shon Flanary; 19. Matt Cooper; 20. Brian Ruhlman; 21. David Stremme; 22. Collin Thirlby; 23. Jeff Babcock; 24. Corey Seckerson. Qualifying 1: 1. Ty Dillon; 2. Wendell Wallace; 3. Dale Mathison; 4. Todd Neiheiser; 5. Jeff Mathews; 6. Devin Gilpin; 7. Tyler Carpenter; 8. Paul Miles; 9. Troy Giralmo; 10. Brendan Gaughan; 11. Nick Kurtz. Qualifying 2: 1. Austin Dillon; 2. Kyle Bronson; 3. Kelly Shryock; 4. Shaun Daugharty; 5. Scotty Kincaid; 6. J.R. Mason; 7. Corey Daugherty; 8. Kevin Gummere; 9. Jason Beaulieu; DNS. Jacob Poel. Qualifying 3: 1. Justin Allgaier; 2. Tyler Nicely; 3. Collin Thirlby; 4. Justin Marks; 5. Gary Cook Jr; 6. Buzzie Reutimann; 7. Lonnie Wagner; 8. Matt Crafton; 9. Nathan Seale; 10. Dalton Lanich. Qualifying 4: 1. Kenny Wallace; 2. Jake Griffin; 3. Matt Cooper; 4. David Stremme; 5. Mitchell Opatik; 6. Levi Kissinger; 7. J E Stalder; 8. Scott Mooers; 9. Larry Burkins; 10. Brandon Davis. Qualifying 5: 1. Ken Schrader; 2. Nick Hoffman; 3. Joel Ortberg; 4. Max Gresham; 5. Denny Schwartz; 6. Joe Carr; 7. Dave Baldwin; 8. Tony Anderson; 9. Rob Underwood; 10. Richard Michael Jr. Qualifying 6: 1. Kody Weisner; 2. Dave Wietholder; 3. David Reutimann; 4. Todd Sherman; 5. Jeff Thomas; 6. Nate Zimmer; 7. Trey Bryant; 8. Dwight Niehoff; 9. David Mielke; 10. Carl McGowin. Qualifying 7: 1. Bryce Jewell; 2. Jeff Babcock; 3. Brian Shaw; 4. Brian Ruhlman; 5. Matt Westfall; 6. Garrett Stewart; 7. Jeff Walston; 8. Nick Tharp; 9. Jonathan Taylor; 10. Bryan Barber. Qualifying 8: 1. Rodney Sanders; 2. Kyle Strickler; 3. Corey Seckerson; 4. Shon Flanary; 5. Bart Hartman; 6. Mike Wedelstadt; 7. Joey Galloway; 8. Jared Allison; 9. Donovan Lodge; 10. Masen Big Eagle; 11. James Smith. Heat 1: ; 1. Dale Mathison; 2. Ty Dillon; 3. Jeff Mathews; 4. Todd Neiheiser; 5. Paul Miles; 6. Brendan Gaughan; 7. Tyler Carpenter; 8. Nick Kurtz; 9. Devin Gilpin; 10. Wendell Wallace; 11. Troy Giralmo. Heat 2: ; 1. Kelly Shryock; 2. Kyle Bronson; 3. Austin Dillon; 4. Jason Beaulieu; 5. Jacob Poel; 6. Kevin Gummere; 7. Shaun Daugharty; 8. Scotty Kincaid; 9. J.R. Mason; 10. Corey Daugherty. Heat 4: ; 1. Matt Cooper; 2. Kenny Wallace; 3. David Stremme; 4. Levi Kissinger; 5. Jake Griffin; 6. Larry Burkins; 7. Scott Mooers; 8. J E Stalder; 9. Brandon Davis; 10. Mitchell Opatik. Heat 5: ; 1. Nick Hoffman; 2. Ken Schrader; 3. Max Gresham; 4. Denny Schwartz; 5. Joel Ortberg; 6. Joe Carr; 7. Richard Michael Jr; 8. Dave Baldwin; 9. Tony Anderson; 10. Rob Underwood. Heat 6: ; 1. Kody Weisner; 2. David Reutimann; 3. Dave Wietholder; 4. Todd Sherman; 5. David Mielke; 6. Dwight Niehoff; 7. Jeff Thomas; 8. Nate Zimmer; 9. Trey Bryant; DNS. Carl McGowin. B-Main 1: ; 1. Austin Dillon; 2. Brendan Gaughan; 3. Tyler Carpenter; 4. Kevin Gummere; 5. Wendell Wallace; 6. Scotty Kincaid; 7. Nick Kurtz; 8. Jeff Mathews; 9. Todd Neiheiser; 10. Jason Beaulieu; 11. Paul Miles; DNS. Jacob Poel; DNS. Shaun Daugharty; DNS. Joey Galloway; DNS. J.R. Mason; DNS. Cory Daugherty. B-Main 2: 1. Tyler Nicely; 2. David Stremme; 3. Jake Griffin; 4. Gary Cook Jr; 5. Levi Kissinger; 6. Matt Crafton; 7. Dalton Lanich; 8. Buzzie Reutimann; 9. Mitchell Opatik; 10. Justin Marks; 11. Nathan Seale; 12. Larry Burkins; 13. Troy Giralmo; 14. Lonnie Wagner; 15. Scott Mooers; 16. Brandon Davis; DNS. J E Stalder. B-Main 3: 1. Dave Wietholder; 2. Denny Schwartz; 3. David Mielke; 4. Todd Sherman; 5. Dwight Niehoff; 6. Richard Michael Jr; 7. Joel Ortberg; 8. Rob Underwood; 9. Tony Anderson; 10. Joe Carr; 11. Jeff Thomas; DNS. Matt Gresham; DNS. Dave Baldwin; DNS. Nate Zimmer; DNS. Trey Bryant; DNS. Carl McGowin. B-Main 4: 1. Bart Hartman; 2. Bryce Jewell; 3. Joey Galloway; 4. Kyle Strickler; 5. Jonathan Taylor; 6. Brian Shaw; 7. Jared Allison; 8. Donovan Lodge; 9. Matt Westfall; 10. Garrett Stewart; 11. Nick Tharp; DNS. Rodney Sanders; DNS. Mike Wedelstadt; DNS. Bryan Barber; DNS. J.R. Mason; DNS. Masen Big Eagle; DNS. James Smith. The DIRTcar UMP Modified portion of the University of Northwestern Ohio DIRTcar Nationals by Summit Racing Equipment is brought to fans by several sponsors and partners including Summit Racing Equipment, Hoosier Racing Tires, Chevy Performance, University of Northwestern Ohio, Arizona Sports Shirts, Auto Meter, Bell Helmets, Beyea Custom Headers, Bilstein Shocks, Cool Shirts, Dominator Race Products, Fast Shafts, FK Rod Ends, Fragola Performance Systems, Impact Race Products, Intercomp, Landrum Springs, Racing Electronics, Vicci, KSE Racing Products, MSD Ignition, QA1, Quarter Master, Schoenfeld, XS Power Racing Batteries, VP Racing Fuels, and Wrisco Aluminum.